Saying it was a mistake to sell off the old bridge before it was known whether the new one would work properly, Karl Love has met with the current owner of the previous Floating Bridge. 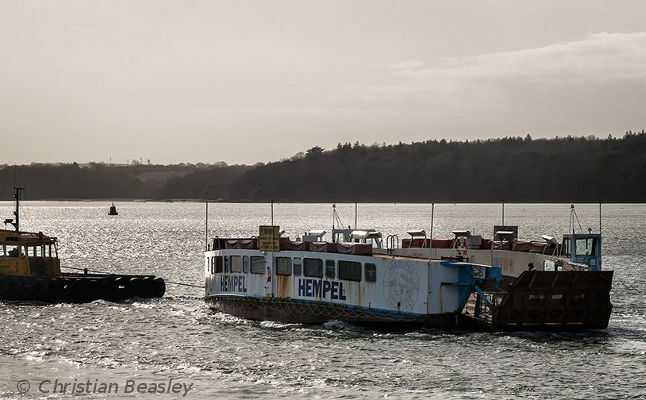 East Cowes councillor, Cllr Karl Love, said he had met with the owners of Floating Bridge 5 on several occasions in recent weeks, and thought it was possible the old chain ferry could be brought back into service. The former bridge is still moored in Gosport and for sale, with the price on application. A spokesperson for the owner, Apollo Duck, said there had been significant interest from abroad and the vessel could soon be sent overseas. “I’m very happy to hear other people’s suggestions and, from what I have heard in my discussions, there is a credible option which any council should be willing to listen to. 9 Comments on "East Cowes coucillor meets with owner of previous Cowes Floating Bridge"
In response to holdmyheadinmyhands, you need to do some research before commenting on Cllr Love. The Isle of Wight Council stated a significant time ago that FB#5 would be kept until FB#6 had been accepted. Then some bright spark in the council decided to sell it off early for a paltry sum. How much did the IWCC sell Floating Bridge 5 for? I don’t suppose they named the buyer as I note that the report says the owners agent is Appollo Duck but i expect they would blame that on the Data Protection act?